This Duluth Forge Electric Fireplace instantly adds warmth and elegance to any room and is quite simply a beautiful and versatile piece of quality furniture. This electric fireplace can live in an antique, modern, bohemian, industrial, minimal, or any other type of home. The fireplace has been carefully designed and created using furniture quality materials and finishes in a rich Auburn Cherry furniture grade finish with 30% sheen that accents its quality and excellence. The electric fireplace insert features a large glowing ember bed, molded logs, adjustable background lights and is also operable independent of the heat for true year-round enjoyment. 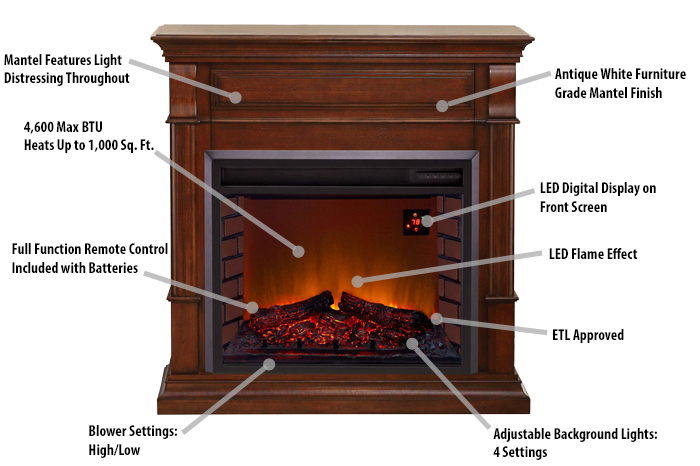 The electric fireplace insert has a digital read out with manual controls as well as a remote control to ensure the best performance. Using the remote control you have everything you need to create a cozy atmosphere at your fingertips. The included remote allows you to turn the unit on/off, adjust the thermostat temperature, set the timer, control the flames, adjust the background lights and more! Easy to Use - No outside duct or chimney needed!